I started out the 2011 season in a new city and unemployed. This situation offered both positives and negatives for training. The positives were that I had ample freedom and time (around interviews) to train. 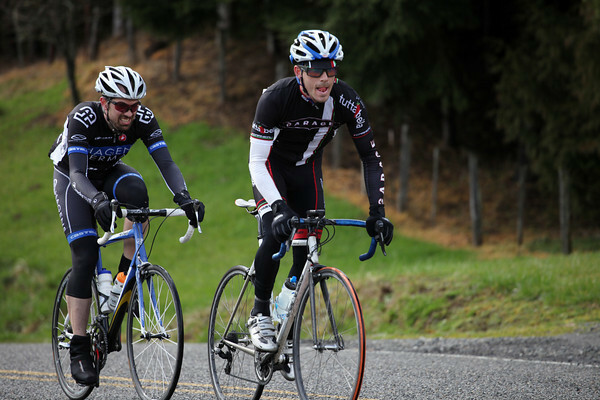 The negatives were that I didn’t have a team, had no idea where to ride, and it was January in Seattle. The positives outweighed the negatives and I was able to stick to a solid training plan, and put it a lot of very wet and cold base miles. I was feeling fit and strong in February when I first made contact with a Garage rider, and by March when I joined the team I was as strong (minus high-end intensity) as I was at the end of the previous season. That’s when race season started, and my eyes were re-opened to the stark differences between training strong and racing strong. 1. You just can’t race like an idiot doper unless you are one (Independence Valley RR). 2. It also doesn’t help to race like a pissed off teenager (Sequim RR #2). All three of these lessons I’m pretty sure I learned my first season racing. I’m pretty sure I learned them again my second season. I’m pretty surprised that I’ve needed to learn them again this season. Maybe this time around (third time is a charm right?) I will actually learn and develop a bit better racing sense. So far the racing season has not gone as I planned, but I guess that’s bike racing. It’s a good thing we do this because we love riding our bikes, otherwise it would just be to dam much.